Arrow Films, the distributors of The Hunt, A Hijacking and Love Is All You Need, are pleased to announce the DVD release of the acclaimed Austrian feature, Amour Fou, which debuted in the Un Certain Regard strand at the 2014 Cannes Film Festival to a host of positive reviews. Amour Fou is the follow up to director Jessica Hausner’s acclaimed 2009 picture Lourdes. Berlin, the Romantic Era. Young poet Heinrich (Christian Friedel, White Ribbon) wishes to conquer the inevitability of death through love, yet is unable to convince his sceptical cousin Marie to join him in a suicide pact. It is whilst coming to terms with this refusal, ineffably distressed by his cousin's insensitivity to the depth of his feelings, that Heinrich meets Henriette (Birte Schnoeink), the wife of a business acquaintance. Heinrich's subsequent offer to the beguiling young woman at first holds scant appeal that is until Henriette discovers she is suffering from a terminal illness. 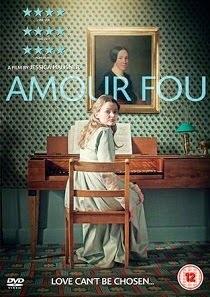 AMOUR FOU is a "romantic comedy" based loosely on the suicide of the poet Henrich von Kleist in 1811.